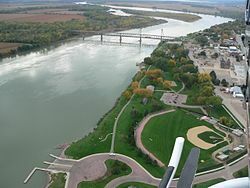 YANKTON, S.D. - Yankton downtown business owners have created a district to give the area an identity. The Yankton Daily Press and Dakotan reports some initial projects and initiatives identified by the Meridian District group include marketing, signage and art events. The group will also work to find events to bring people to the area. The district is the creation of downtown business owners, building owners and community members who see a need for change. Mollie Grey, development coordinator for downtown, says she hopes the group will become a non-profit and that it focuses on the continuous improvements of downtown and finically sustains through different funding streams.